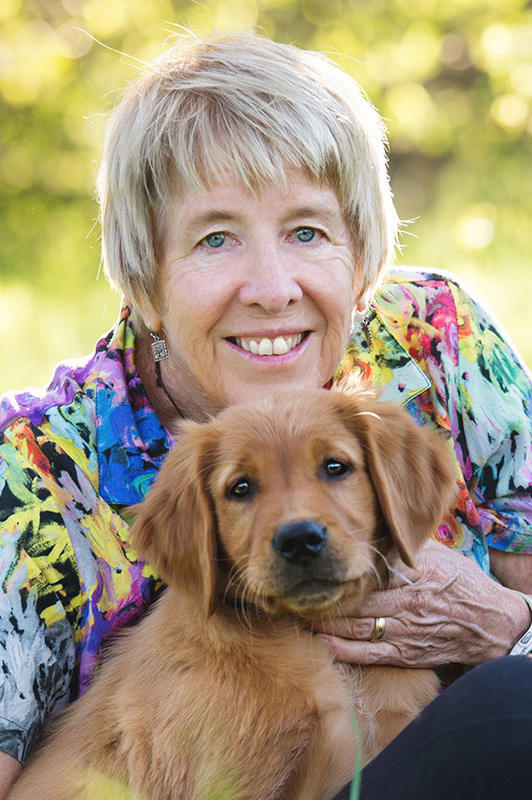 About me, Marge Perry, owner Inspire Hypnosis in Redding, California. Who I am, where I'm from, what I do and what hypnosis can do for you. 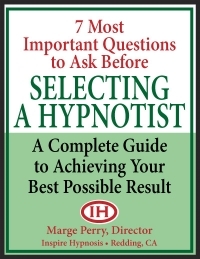 Review my site, then schedule your free hypnotic screening to see if hypnosis is right for you. The About Us page is the most important page of any hypnotist's web site. Why? 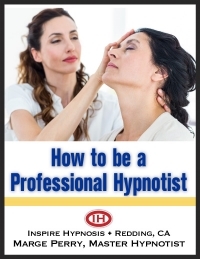 Because hypnosis is an interpersonal relationship between the hypnotist and the person being hypnotized. An interpersonal relationship requires we communicate openly and honestly, have mutual trust, and both make a real and genuine commitment to the achievement of your goals. More simply, we must like and enjoy one another's company. I think you deserve to know who I am, where I'm from, what I do, but most importantly, what I can do for you and how hypnosis can be a life changing experience. I invite you to review this site, then schedule your free hypnotic screening where we can chat, discuss your goals, hypnosis, get to know each other and determine if we are a match. I was born and raised in Whittier, California where I also attended high school. I attended Colorado State University in Ft. Collins and graduated from University of Oregon. I love the outdoors and spend free time backpacking, hiking, kayaking, camping, sailing and biking. I'm also an aspiring artist with a long way to go. I'm content, enjoy peace of mind, been blessed with a happy and rewarding life. My interests include old movies, folk music and reading. 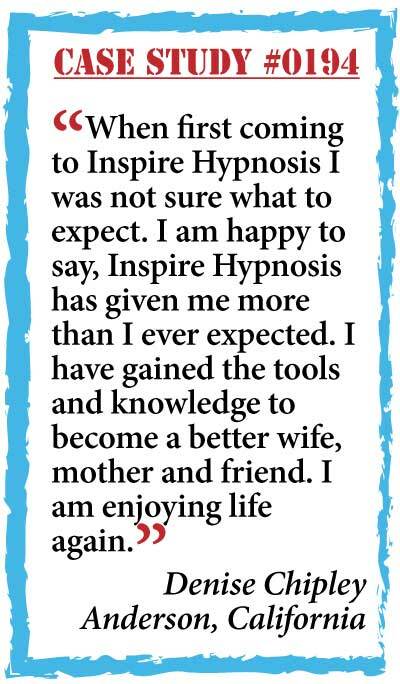 I've owned and operated Inspire Hypnosis since 2006. 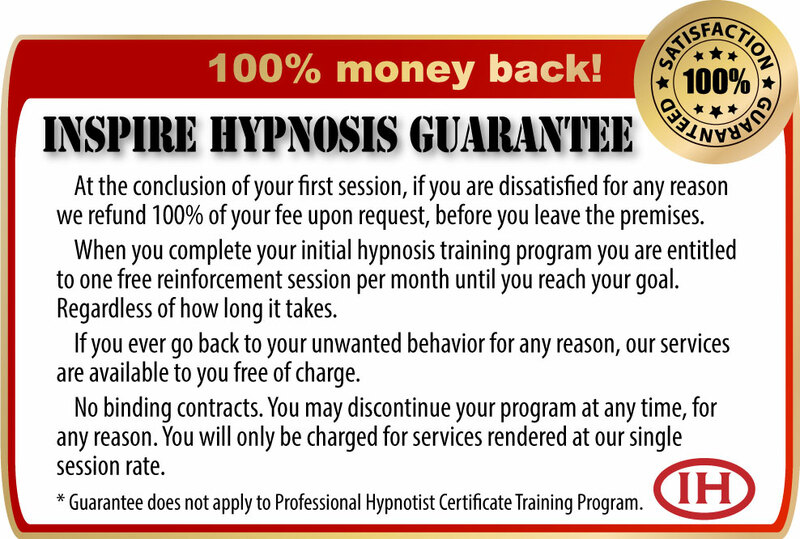 I'm a certified Master Hypnotist receiving intensive training by the International Hypnotist Training Institute. I'm also a Master Hypnotist Society certified trainer. Inspire Hypnosis was opened for the purpose of offering people of Redding, California, and surrounding areas, an effective alternative to fad diets for weight loss, the patch for nicotine withdrawal, pills and addictive stress management medication. 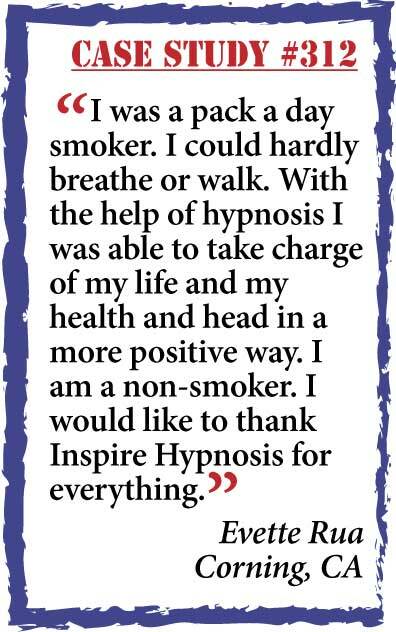 Inspire Hypnosis' educational services include hypnotic weight loss, stop smoking with hypnosis, and reducing stress and anxiety with hypnosis. We also offer hypnosis for medical applications like pain management, insomnia and cancer treatment support. All medical applications require a physician's referral. We would be happy to speak to your doctor about treatment upon your request. As a full service hypnosis practice, we also offer training for those who have interest in a career as a professional hypnotist. Inspire Hypnosis also offers a free lecture demonstration in hypnosis for organizations like Rotary, Kiwanis, Chamber of Commerce, churches, schools and PTA. I offer you a genuine opportunity to change unwanted behavior, end dangerous habits and change your perspective on life from rushed, chaotic confusion to calm assured controlled confidence. Hypnosis can do everything I've said. Hundreds of documented case studies are available for review in my office. A preponderance of proof to the value of hypnosis. Do not underestimate the results you are capable of achieving with hypnosis. I've seen results that defy human belief. For more information about hypnosis and its benefits, limitations and uses, simply download my three Special Reports. Review the remainder of my site for more specific information and feel free to call me with any questions you may have. Thank you for visiting my site. I hope it answers your questions.